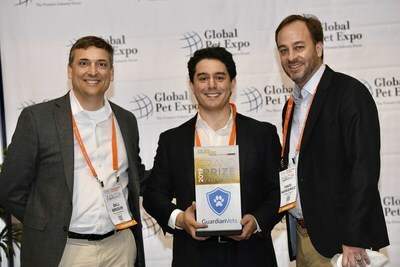 ORLANDO, Fla., March 21, 2019 /PRNewswire/ -- Five pet-focused startups took the stage at the pet industry's largest trade show, Global Pet Expo, pitching their businesses to an audience of investors, retailers and the pet care leaders at Purina, and GuardianVets emerged as the grand prize winner of the 2019 Pet Care Innovation Prize. The Chicago-based startup is a B2B telehealth service and platform that allows veterinary hospitals to offer 24/7 continuous client care. GuardianVets is the exclusive triage provider for the American Animal Hospital Association (AAHA) and serves more than 600,000 pet owners in over 30 states. GuardianVets was selected by a panel of industry judges including Bryan Jaffe of Cascadia Capital, Nicole Mitchell, Director of Membership at the American Pet Products Association (APPA), Andrea Faccio, Chief Marketing Officer at Purina, and Bill Broun and David Narkiewicz from Purina's 9 Square Ventures Division. As the 2019 Pet Care Innovation Prize grand prize winner, GuardianVets will receive a cash prize and the opportunity to work with Purina on a project. "I'm very appreciative and thankful to be the grand prize winner of the Pet Care Innovation Prize and hope to use this opportunity to continue to move GuardianVets forward and help strengthen the relationship between pet owners and their veterinary practices," said John Dillon, founder of GuardianVets. "The PCIP program is built on developing comradery within the pet industry, and it's amazing to see a leader like Purina support startups in such a personal and impactful way." Chicago-based Shameless Pets uses upcycling to turn ingredients that may have otherwise been lost or wasted into premium pet treats that support your pet's health. Boulder-based Bond Pets is working with cellular agriculture technologies to reinvent pet nutrition, making nutritionally-superior dog and cat foods sourced from real animal protein – without harming any animals in the process. Los Angeles-based Basepaws is a pet genetics company that has developed the first consumer genetics test for cats, which includes detailed information about breed, traits, health, and genetic markers for potential hereditary disease. New York-based PlayDate rounds out the Pet Care Innovation Prize 2019 class and is building a smart pet monitoring system, beginning with toys, to keep dogs and cats happy and healthy throughout their lives. "Congratulations to GuardianVets and all of the 2019 Pet Care Innovation Prize winners who collectively exemplify the range of innovation in the pet care category," said Bill Broun, Co-Lead of Purina's 9 Square Ventures Division and Vice President of Personalization and Business Development at Purina. "There is no doubt that this class of entrepreneurs will make a positive impact on our industry and the lives of pets and their owners." The Pet Care Innovation Prize is a collaborative effort of Purina's 9 Square Ventures division with investing leaders, Active Capital, to support and connect with early stage pet care startups addressing pet and pet owner needs in the areas of pet health and wellness, services, technology, nutrition and emerging innovations. In addition to the chance to compete for the grand prize at Global Pet Expo, the five first round winners each received $10,000 in cash from Purina with no strings attached along with a weeklong experience at a pet care business accelerator boot camp in Purina's hometown of St. Louis where they met with industry experts both at and outside of Purina. Visit petcareinnovationprize.com for updates on the next competition.